High speed in Indian Railways is at present limited to 150 KMPH. However, in many other countries the speed of Railways is of the order of 200 KM per hour (KMPH). In France, Japan, Germany, China, Spain and South Korea high speed traction above 280 KMPH has been introduced. India and Japan have signed a memorandum of understanding (MoU) on 12th December, 2015 on cooperation and assistance in the Mumbai–Ahmedabad High Speed Rail (HSR) Project referred to by many as ‘Bullet Train Project’. Japan has offered an assistance of over Rs. 79,000 crore for the project. The loan is for a period of 50 years with a moratorium of 15 years, at an interest rate of 0.1 per cent. The project is a 508-kilometre Railway line costing a total of Rs 97,636 crore, to be implemented in a period of seven years. It has been agreed that for the Mumbai – Ahmedabad HSR Project. Japan’s Shinkansen Technology, known for its speets reliability and safety, will be adopted. Transfer of technology and “Make in India” will be essential part of this assistance package. Japan will also assist India in training of personnel for HSR.’ The two countries have also entered into two comprehensive technological cooperation agreements on 11th Decmber 2015, for modernization and upgradation of Indian railways. These agreements have been signed during the official visit to India of His Excellency Mr. Shinzo Abe, the Prime Minister of Japan, during December 11-13, 2015. Speaking on the occasion, Prime Minister Mr Narendra Modi said the decision to introduce High Speed Rail on the Mumbai-Ahmedabad sector through the Japan’s Shinkansen is no less historic. He said “We greatly appreciate Prime Minister Abe’s extraordinary package of approximately 12 billion U.S. dollars and technical assistance, on very easy terms, for this project.This enterprise will launch a revolution in Indian railways and speed up India’s journey into the future. It will become an engine of economic transformation in India.” With this significant development, the stage is all set for acceleration of commissioning of Indian High Speed Rail Project which has been in various stages of planning during the last one decade. Indian Railways Vs Road Transport Indian Railways is an energy efficient mode of Transportation in our country. Energy consumed by railways is one sixth of corresponding energy consumed by road transport. At the same time Railways in India now run Primarily on electricity which can be derived from modes other than oil including New and Renewable energy sources like wind and solar. Keeping in view the global oil crisis, and India’s dependence on imports for crude oil, Indian Railways is an ideal means of transportation. Railways use one third of the ‘Right of Way’ as compared to the Road. This is another useful factor for our populous country where land scarcity will always be an issue. The Rail Coefficient ( percentage of use of Rail) of passengers as well as freight which stands at about 10 percent and 35 percentat present is declining as less capacity has been added to the Rail Sector. Increasing Rail Coefficient by expanding capacity is in wider national interest. Indian Railways is the third largest railway network in the world with 7,083 railway stations, 1,31,205 railway bridges, 9000 locomotives, 51,030 passenger coaches, 2,19,931 freight cars and 63,974 route kilometers. Today it operates 19,000 trains every day, comprising 12,000 passenger trains and 7,000 freight trains. It transports 2.65 million tonnes of freight traffic and 23 million passengers every day and 7.2 billion passengers per year. It currently has 1.36 million employees and an annual revenue base of Rs.1,64,374 crores as projected on March 31,2015. Railways can potentially contribute an additional 1.5% to 2% to GDP. Thus, Modernisation of Railways is essential to attain goals of National progress. Introduction of High Speed Railways is an important step in this direction. In High Speed Traction, basically two distinct technology streams have developed- (a) Steel Wheels on Rails Technology and (b) Magnetic Levitation Linear Motor Technology. In Steel Wheel on Rail technology maximum development has taken place. A high speed record of 550 KmPH was achieved by SNCF(French Railway). In Magnetic levitation Linear Motor Technology, combined with levitation by Electro Magnetic method is achieved. First commercial service on this Technology was introduced in China between Shanghai and Shanghai Airport in 2004. Japan operates two independently developed maglev trains. One is HSST (and its descendant, the Linimo line) by Japan Airlines and the other, which is more well-known, is SC Maglev by the Central Japan Railway Company. In Japan latest Shinkansen line is being constructed on this technology. In line with global trends, the First Indian High Speed Rail Project between Mumbai and Ahmedabad is proposed on conventional Steel wheel on Rail technology. Globally France was the first European country to construct a high-speed rail line (the Paris- LyonLine, which opened in 1981). Since its creation, the TGV network has been regularly extended to cover 1,840 km. In Germany, the total length of the ICE High speed network is 1330 km. Initially, ICE trains were travelling at 250km/h but the project Köln- Frankfurt is the very first real high-speed line dedicated to passenger traffic for the speed of 300 km/h. In Spain between 2003 and 2008, the AVE network was extended to Malaga, Valladolid and Barcelona. The Spanish High speed Corridor is at present 3100 km making it the largest in Europe and the maximum speed is 310 km/h. In Japan, first high-speed train corridor (the Tokaido Shinkansen, from Tokyo to Osaka) was created in 1964. Since then, Japanese rail network has experienced a phenomenal growth with the opening of 7 Shinkansen corridors; each line has its own name (Tokaido, Tohoku etc. ), and each type of train is identified by a name (Nozomi, Hikari etc.). The actual Shinkansen network is more than 2000 km long. The development of further lines has been authorised, of which 500 km are currently under construction. China’s first very highspeed rail line was opened in August 2008, linking Beijing South Railway Station to Tianjin, where sporting events were held during the Olympic Games. The construction of highspeed railways in China began with the building of the Qinhuangdao–Shenyang High-Speed Railway in 1999. Now the high-speed rail network in China is the largest in the world. In India, Railways have adopted two pronged strategy to increase the speed on existing Corridors. This strategy is in line with most other High Speed Rail operating countries like China, France, Japan and South Korea.The Maximum speed of passenger trains would be raised from 110 or 130 kmph at present to 160-200 kmph. Indian Railways propose to invest in developing high speed corridors of 250 to 350 kmph speed. Already six corridors have been identified. It is expected that the high speed executed rail corridor will become a catalyst for India’s economic growth, a stimulus for the development of satellite towns and reduction of migration to metropolises. It is proposed to set up a National High Speed Rail Authority for planning, standard setting, implementing and monitoring these projects. Two important components of Indo-Japanese agreements signed on 12th December, 2015 are cooperation in Research and Development in High Speed and Related Fields of Rail technology. The main emphasis for our country (which is fortunate to have a large railway network that will help us fight the Climate Change Challenge) should be on development of Know how and Know why in the field to become ultimately the net exporter of Rail technology. In this regard, the importance of these agreements is even more than that of the High Speed Rail Construction agreement. Memorandum of Understanding (MoU) on technological cooperation between Research Design and Standards Organization, India and Railway Technical Research Institute, Japan will pave way for (i) Safety in train operation; (ii) Advanced techniques of maintenance; (iii) Use of environment friendly technologies; (iv) Throughput enhancement measures; and (v) Any other area jointly agreed upon by the Parties. Memorandum of Cooperation (MoC) between the Ministry of land, infrastructure, transport and tourism of Japan and the Ministry of Railways of the Republic of India on technological cooperation in rail sector include technology exchange programme in (a) Railway safety; (b) Rolling stock including train sets/EMU; (c) Information sharing for station development and land value capture; (d) Information sharing for environment friendly sanitation technology in trains (e) Signaling and telecommunication; (f) Railway electrification; (g) Civil structure and railway track system; (h) Train control system; (i) Mitigation of natural disasters; and (j) Any other areas jointly determined by both sides within the scope of this MoC. In India, traditionally various Research Institutes like IIT BHU, IIT Kharagpur, etc are engaged in Research in these areas. These agreements may provide a new much needed fillip to these activities. 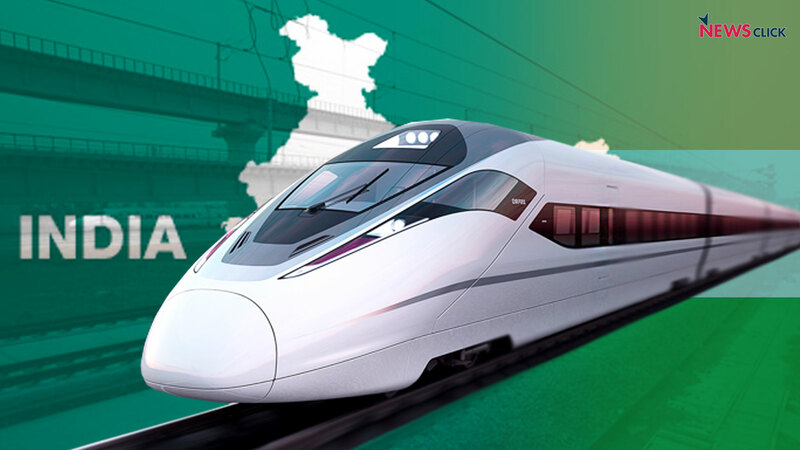 Prior to the detailed study by Japanese experts, railways had commissioned the Systra-Rites-Italferr consortium to conduct an international review of market scenario of High Speed Passenger Railway for feasibility study for Pune-Mumbai- Ahmedabad High Speed Corridor. The study has found the project as feasible. The average construction cost per kilometre of double track line comes between Rs. 76 to 84 cr depending on alignment option. The lower costs of manpower and civil structures in India compared to Europe explain the reduction in construction costs by 30-40 per cent compared to similar European projects. There has been criticism of this project from several quarters that India cannot afford to spend such a large amount of Rs. 97,636 crore on bullet train from Mumbai to Ahmedabad. However, one should know that this amount is to be spent over a period of seven years. Secondly, almost 80% of the project is being financed on a very soft loan from Japan. Rs. 79,000 crore offered by Japan is to be repaid over 50 years at an interest rate of 0.1 percent per year. Further, the loan comes with a 15-year moratorium which means that India does not need to start repaying the loan immediately. A loan at an interest 0.1 percent to be repaid over 50 years essentially means almost no interest is being charged. Moreover, in 50 years time, the project will also start generating some revenue. In effect, the Japanese government is giving a loan to the Indian government at almost zero percent interest, in order to be able to buy technology from Japanese company Shinkansen. Once these factors are taken into account, the bullet train project between Mumbai and Ahmedabad will not be a drain on the government finances. By cutting down the journey time across the country in a climate friendly way, the project will unleash the true potential of young India and will be a corner stone in our journey towards inclusive progress. By improving Research & Development and Manufacturing in this field, where India has the largest presence in the World, we will be poised to become net exporter of Rail Technology to the world. Bullet trains would provide big boost to Indian Railways with advanced safety, technology transfer, skill development and huge influx of resources.